If you've landed here, it's likely you already have an Amazon ereader and you're looking for a way to protect your device in your bag or even while you're deep in the latest Jack Reacher novel. That's why we're here to recommend some of the best cases and covers for each version of the Amazon Kindle that's currently on sale. Below you'll find two cases we love for each current Kindle product, including the latest versions of the Amazon Kindle, Kindle Paperwhite, Kindle Voyage and the Kindle Oasis. Note: we've scoured the web for all of the Kindle cases and covers out there on sale right now and here are a selection of the ones we like the look of. These have been ranked from cheapest to most expensive according to prices at time of writing. 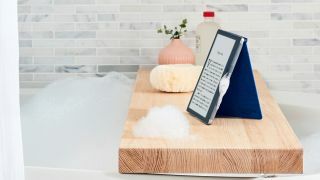 Note: the cases listed will only fit the most recent version of the Amazon Kindle, which was released in 2016 and is often referred to as one of the eighth generation Kindles. This case comes with drop protection, so if your Kindle takes a tumble out of your hand toward the floor it should help protect the corners, edges and - thanks to its raised sides - even the screen. You've only got a choice of pink or blue for this Kindle cover and there's no protection against scratches on your screen while it's tumbling around in your bag, but it'll protect the edges nicely. Amazon has produced a protective cover for the Kindle that doesn't cost the earth and will make sure you don't scratch up and dent the edges and rear of your Kindle when you're reading on the move. You can buy it in black, blue, pink or white and it gives the generally quite dull looking Kindle a big splash of color that some will love. With a durable fabric material on the inside and an automatic wake function when you flip the case lid up, this may well be the best cover for your Kindle. Note: the cases below fit all generations of Kindle Paperwhite products, so they'll be suitable for any version of the Kindle Paperwhite ereader you own. Again this case is from Amazon and the company has promised it's suitable for all versions of the Kindle Paperwhite, no matter when you bought your device. The color options here are limited to blue, black, pink and white, but there are some bold choices if you're looking for a striking cover for your Kindle, and the case also comes with a cover for the screen, so you can be safe in the knowledge that it's not going to get scratched while in your bag. If leather is the look you'd like to spread all over your ereader, this case from Amazon is likely the best choice to wrap your Kindle Paperwhite up in, and it comes in a selection of color options too. Those colors are orange, pink, black, blue and a deep purple that we really love, plus this case isn't that expensive considering it's made of leather, giving it a premium look and feel. Note: the cases below fit the only generation of the Kindle Voyage, which was released back in 2014. Another case directly from Amazon here and this one for the Voyage can be folded so you can prop up your Kindle and read without having to hold onto your ereader. It's not the cheapest Kindle Voyage cover we've seen, but the design is durable and it'll protect the screen when you've left your ereader in your bag, so it should help you avoid having to read ebooks through scratches. This case is largely similar to the one above, but this one comes in leather. Be warned that it isn't cheap as it's a limited edition from Amazon, but it may be what you're looking for to protect your ereader from daily wear and tear, while adding a touch of style. It's a shame this cover only comes in brown, but it's a nice color and really shows off the high quality leather too. Note: the listed cases will only fit the most recent version of the Amazon Kindle Oasis that was released in 2017. They won't be suitable for the eighth generation Oasis that came out in 2016. With the Kindle Oasis being waterproof, you'll also want a case that can take the odd splash of water too. That's why Amazon has made this water-safe Kindle Oasis cover that will snap magnetically onto the back of your super-premium ereader. You've got limited color choices of just blue, white or black, but each looks attractive and protects the front of your Kindle Oasis too. This cover also works as a stand, as the name suggests, so you can use your Kindle Oasis hands-free. The only downside is that while covering the front it doesn't cover (and therefore doesn't protect) the thick part of the Kindle's rear. Our final case for the Kindle Oasis also comes from Amazon itself, and it's a fairly premium though less water-safe alternative to the cover above. You have color choices of black or tan leather, despite the image above also showing a dark brown (as that's not currently on sale). When you've got the Kindle open the case lets you prop it up so you can read easily, and the slim design means it won't feel much thicker than the Kindle itself.